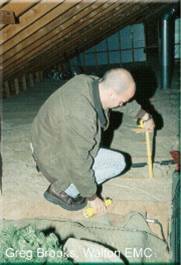 A DIY home energy audit is quite different than a professional home energy audit. A professional, certified energy auditor is trained and equipped with expensive diagnostic equipment to evaluate your mechanicals, air leakage, insulation, water, electrical and combustion systems. Energy auditors are supposed to provide you with a detailed report on how your home operates, the areas where improvements should be made, a prioritized list of recommended energy measures, and an itemized list of improvement costs, savings, and payback. But professional home energy audits can cost anywhere from $250 - $3,000, depending on the size of home, and the services chosen. These prices are hard to swallow for many owners of older homes. Not sure if you are ready for a pro? Then consider performing a "preliminary visual home energy audit" yourself. Not only is a DIY preliminary home energy audit great to better understand your home, it also helps prioritize your energy projects. You will be better informed about your home when speaking to contact an auditor or contractor, or you can decide what projects to tackle yourself. The process usually takes a couple of hours. I have put together a series of brief, simple guides for homeowners to effectively perform a visual home energy audit. Each guide outlines the particular energy-related issues to be aware of, along with pictures, suggestions, and a survey of questions to help you assess your needs. Performing a DIY home audit assumes that you have reviewed your utility bills and have a solid idea of your usage patterns and costs over the seasons. If you need help in understanding your bills, and what you actually pay for, read the section in Utiliy Bills 101 or go to "Get to Know Your Utility Bill". After performing the visual evaluation of your home, you are ready to organize your projects according to the 3Fs - form, function, and 'fficiency. There are many energy upgrades that incorporate form and function, especially those involving your exterior, kitchen and bathrooms. So, often, you can apply for governmental incentives, rebates, or tax credits for remodeling projects that not only reduce energy, but also enhance your living spaces. See your cost and energy savings for replacing light bulbs. Send your energy tips, photos, or experiences, and funny stories, OR, ask questions. We will publish them for everyone to see! If you offer real estate products and services related to home remodels or savings, please make a Directory Submission here. Female-owned professionals, contractors, handy-persons, techs and tradespeople are particularly encouraged to submit. Halloween MUST READ: The definition of HELL by a chemistry student - scroll down to my October 31,2011 blog entry. What did the California wind farm say when it met Lady Gaga? - We’re big fans of yours! - Use a credit card.